Castleford Tigers have confirmed Jake Webster is leaving to join Bradford Bulls at the end of the 2018 season. The former New Zealand international centre, 34, has agreed a two-year deal with the League One club after six seasons at The Jungle. Webster was part of Castleford side that lost 24-6 to Leeds Rhinos in the 2017 Super League Grand Final. "I have a very heavy heart leaving Castleford," Webster told the club website. "The biggest memory from my time here at Castleford will be the fans in the stands. They've been fantastic, and they follow us everywhere we go. "Winning the League Leaders' Shield (in 2017) will always stick out at the pinnacle of my time here at Castleford." Tigers coach Daryl Powell said: "I would like to place on record the appreciation of all the coaching staff here of Jake's contribution and wish him all the best in the next stage of his career." 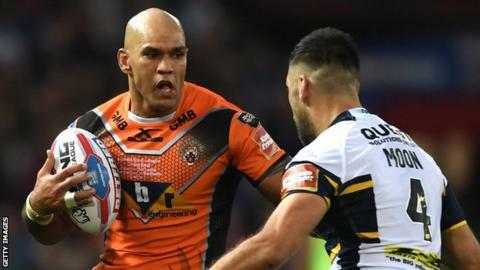 Webster, who has made 120 appearances for Castleford, could yet end his time at the club on a high as they aim to reach back-to-back Grand Finals.